Richard at Read/WriteWeb reckons Digg needs editors, and judging on the quality of some of the submissions we can see that he has a point. But Digg prides itself on being entirely user-generated and automated, so we have a conundrum here. 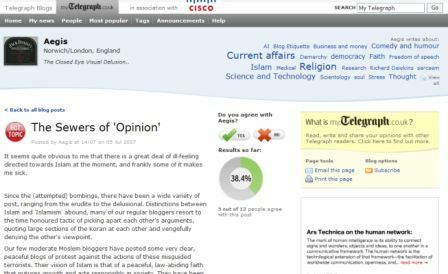 Should Digg change its business strategy by allowing pesky humans to moderate, tweak and ‘improve’ submissions by other, less-grammatically sound humans? Or, should it rely on automation and better functionality to help reduce these issues? Richard’s key concern relates to the ability for Digg’s submitters to post unintelligible descriptions, when adding an article. He says articles that are badly submitted are bad for Digg readers and also for publishers, and he’s not wrong. However, we know that Kevin Rose has been pretty much 100% against the introduction of editors. Witness the relaunch of Netscape last year – and subsequent reaction from Kevin – as proof of this. So how readily would he introduce the blessed Brain Police? Since Digg is built on user interaction / ratings there is an obvious human element to it, but moderation is something that remains a bit of an issue. Some element of power user moderation might be acceptable, but my feeling is that Kevin wants the app – or the masses, rather than individuals – to do the legwork. It has worked pretty well so far, after all. Adwords-style grammar / spellcheck, with whatever rules Digg wants to throw in there (eg ‘nothing profane’). It should do this in headlines and descriptions, rejecting submissions and highlighting errors, rather than the existing optional spellchecker. Anyway, no real need for moderators here. Making power users even more powerful. This is what Richard McManus suggests, and it could work well. But ultimately, the trouble with handing over moderation duties to power users is that we’ll no doubt see examples of abuse. Mac fanboys rewriting Bill Gates stories in unsavoury terms… that kind of thing. All highly amusing, potentially, but as a rule I try to keep clear of Demigods, Despots and Dragons. So I’m not 100% sure about this one, though it could be the obvious answer. Improved duplication filters / rules. Digg’s duplication system works ok, up to a point. It asks ‘is this article the same as these other articles?’ but it is up to the submitter to moderate that decision. So long as the URL is different, you get a pass. Hmmm. In the case of AP-syndicated content hosted on multiple sites, one story is much the same as another. Could Digg quickly crawl third party articles to put them through a ‘duplicate content’ test? The introduction of user-generated tags. This way stories can be auto-categorised, albeit by humans, and Digg can spawn more ‘channels’, underpinned by user tags. It should help it on the search engines too. Findability! One person’s optimization is another person’s optimisation. Tags may be passé to some, but they’re incredibly effective. Nested articles. Digg should look at introducing a ‘nested view’ of related articles. Google News does a good job of aggregating related content, and it knows when a story has moved on sufficiently to create a new ‘nest’. I feel that Digg could introduce a new kind of ‘view’ here, which would de-isolate stories. See Google Trends too for a more visual example of where this could go, and Digg has shown itself to be good at visualisation. Might be interesting. headlines, for consistency. Note: I do not mean CAPS LOCK. In fact Digg should ban CAPS LOCK, on general principles. There should be laws against this sort of thing. Laws enforced by rabid dogs. I’m sure there are plenty of others… right? And yes, point 3 invokes the Brain Police, so perhaps I should change my headline. Hitwise UK has some interesting figures showing how effective widgets can be in driving traffic to websites from social networks. Slide.com and RockYou, two providers of photo-sharing widgets, have moved rapidly up the rankings in the photography websites category, according to Heather Hopkins. The Telegraph’s readers blogs seem to have been a success so far – just eight weeks after the launch of MyTelegraph, over 4,500 have started up their own blogs on the site.